It’s been 18 years since London-born Lennox Lewis tore the lineal title, in March 1998, from Shannon “The Cannon” Briggs, to add to the WBC belt he already owned. Back then, former world title holder Frank Bruno had not fought for two years, but Norfolk’s Herbie Hide still held the WBO strap, he’d won from Tony Tucker the previous year. The mid-late 90s is possibly the most successful spell in British heavyweight history, but now, in 2016, the United Kingdom’s current crop of heavyweights are looking to change that. Tyson Fury became universally regarded as the number one heavyweight in the world the night he bamboozled “Dr Steelhammer” in Germany, last November, derailing the reign of the only active, remaining Klitschko. Fury is “the man who beat the man.” Anthony Joshua is now inside most independent top 10 ratings. David Haye, Derek Chisora, Dillian Whyte, and Hughie Fury, are close behind – two or even three of these men could easily gate-crash the top 10 within the next 12 months. Here, we highlight the top 5 British heavyweights who are looking to stamp their authority over the division in 2016. Tyson Fury’s cousin is 19-0 with 10 wins via KO. The 6 foot-6, 235 pound 21 year old is by far the youngest of this article’s British heavyweight quintet. His amateur career culminated in a gold medal at the youth amateur world championships in 2012, before turning professional in March 2013. In just 10 months, the man born in Cheshire, Stockport, fought twelve times, stopping seven of his foes. Hughie is unafraid to travel: his first five fights were in Canada, USA, Northern Ireland, Romania and England. After a fairly slow couple of years since then, Hughie appears to have his momentum back. Last weekend he comfortably outpointed late substitute, veteran, Dominick Guinn, and recently signed a promotional agreement with Frank Warren, the first fight of which is scheduled to take place on April 30. Heavy-handed, but perhaps lacking the consistent one punch power of some of the division’s biggest hitters, it is Fury’s slick ring movement and defensive intelligence which will likely overcome opponents when he steps up in class. This skill-set, coupled with his quick hands and impressive endurance, will ensure he is a handful for any of the leading heavyweights. The former British, Commonwealth and European champion looked to be ready to hang up his gloves after his one-sided loss to Tyson Fury in November 2014. Five straight wins, albeit against a low calibre of opposition, seem to have rekindled the hunger within Chisora. His stocky, 6 foot-1 frame tipped the scales at 253 pounds for his last bout, but he appeared athletic, and still only 32 years of age, Derek should have a couple more big fights left in him. At his best, he’s a tricky proposition for anyone – just refer back to his bouts with Vitali Klitschko, Robert Helenius and Malik Scott for evidence of this. On May 7 “Del Boy” will be in Hamburg, Germany, challenging Kubrat Pulev in a bout that has the ingredients to be a fiery European title fight. The victor will be thrown right back into a bubbling heavyweight mix. As a teenager, the 6 foot-6 Hercules – who spent his early years in Nigeria, before his family moved to Garston, Hertfordshire – had several brushes with the law, but joining a boxing gym at age 18 helped provide the focus he needed. His short amateur career peaked with gold at the London 2012 Olympics. Since then, 15 professional opponents have stepped in the ring with him, all 15 have been KO’d. Only once has Joshua been extended past round 3. His work ethic and dedication to the sport is now as immaculate as his record. Stoppages over faded former world title challengers, Matt Skelton and Kevin Johnson exhibited his power, but it was his previous tussle, with Dillian Whyte, which was far more revealing. Joshua remained composed and unflappable in the build-up, despite being presented with a foe who had beaten him as an amateur, one who was doggedly trying unsettle him in order to gain a psychological edge – it failed. In the ring Whyte fared better, rocking Anthony with a short left hook in the second round. Being shaken badly by an opponent who is unproven at world level is worrying, but more impressively, Joshua soon recovered his senses, and began to take control of the gritty spectacle. It remains to be seen if he can maintain a good pace for a full 12 round, championship length bout, but he proved he could at least carry his power past the half way stage, as a monstrous right uppercut in the 7th round sent Whyte crashing onto the ropes, causing a violent end to their contest. On April 9, Joshua meets Charles Martin at London’s O2 Arena for the American’s newly won IBF title. 131 seconds is all it took the “Hayemaker” to complete his annihilation of the under qualified Australian, Mark de Mori, during his January comeback fight. At 227 pounds, Haye was 17 pounds heavier than he had been for his previous fight, against Chisora, nearly three and a half years earlier. Deservedly or not, Haye has skyrocketed to No.7 in the WBC ratings and No.9 in the WBA ratings: the respective champions of these organisations, Deontay Wilder, and Tyson Fury, are within his sights. A fight with Anthony Joshua would be an instant British pay-per-view blockbuster. Victory is expected on May 21 when he takes on Arnold Gjergjaj, and although the Kosovan-born boxer is only ranked No.35 by the WBC, it will keep the Londoner in the spotlight, helping provide the leverage he needs to negotiate a fight against one of the division’s marquee names. 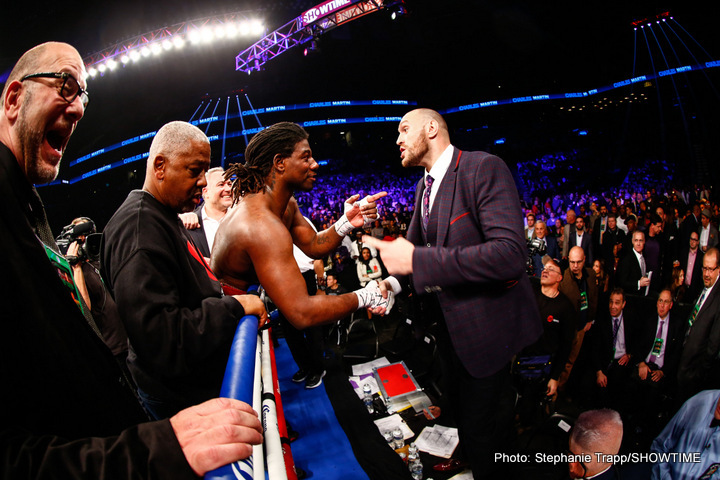 After watching Fury get floored by former cruiserweight, Steve Cunningham, in their April 2013 bout – going on to win the scrappy affair by KO – you could be forgiven for thinking Tyson’s chances of dethroning Wladimir were dire. Anyone that had followed the Englishman’s career, knew that the Cunningham fight was not an anomaly though – Fury’s fights usually contained lapses in concentration, which gifted his opponent opportunities to hurt him. In September 2011 he had to survive a perilous 3rd round against Nicolai Firtha, and then just two months later, he was dropped heavily in the 2nd round by Neven Pajkic. The Chisora rematch and the Johnson fights, however, demonstrated he could adhere to a strategy for the entirety of a fight, but still, few felt he could do this at the highest level: versus Klitschko. At the time Fury’s boasts seemed like empty, self-promoting bravado. Since that night in Dussledorf, Germany, Fury’s words don’t seem quite so outlandish. At 6 foot-9, 250 pounds, he is the tallest lineal heavyweight champion in history. To witness a man of his stature move so skilfully around the squared ring, the way he did when outfoxing Wladimir, truly was unique. Never has a heavyweight champion, as dominant as Klitschko, been humbled in his own backyard, by an overseas fighter. Was it a contest that lacked traditional prize-fight excitement, featuring an aging champion who was past his peak? Possibly, but nobody has ever out-boxed Wladimir as emphatically as Fury did. A rematch is still being negotiated – potentially for July, in the UK – but it is difficult to imagine the outcome being any different. The self-proclaimed “Gypsy King” will then have a queue of intriguing challengers waiting for him. Watching Fury pitted against the likes of Luis Ortiz, Deontay Wilder, Anthony Joshua and Joseph Parker are surely contests no fight fan would want to miss. Next boxing news: Floyd Mayweather Junior-Adrien Broner – could it actually happen?